Whether fighting for justice on the job, preserving retirement security, or protecting the interests of workers, the IAM is always working hard for you and your family. As an IAM member, you are entitled to over 30 special benefits and savings that Union Plus offers, including travel and entertainment discounts, legal services and credit counseling. IAM members are eligible to apply for the IAM Union Plus Credit Card, which puts union solidarity in your back pocket. 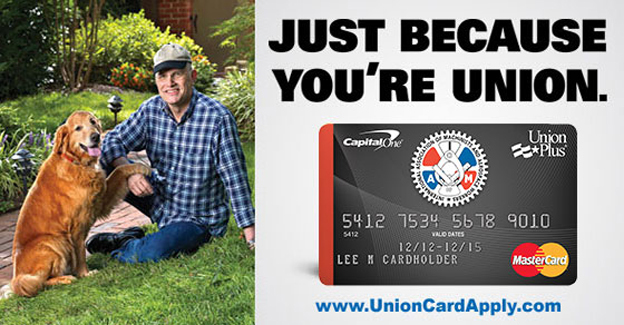 The IAM Union Plus Credit Card features exclusive hardship grants to help cardholders in their time of need, providing more than $2.1 million to help union cardholders facing job loss, disability, strike and hospitalization since 2009. The Union Plus AT&T wireless 15 percent discount means you can save with the nation’s only unionized wireless carrier on select monthly wireless plans – just because you’re union. Over 100,000 union members already enjoy the Union Plus Mortgage program, which provides unique assistance programs, including interest-free loans and grants to help union members make mortgage payments if they are disabled or become unemployed. More than $10.3 million in assistance has been provided to union members.